OTTAWA—As the surge of migrants pouring into Quebec hit 4,500 people — mostly Haitians — in the first three weeks of August, the federal government scrambled Monday to stem the tide with a sterner message to would-be asylum seekers and to accommodate hundreds more in the nearby Ontario border town of Cornwall. The office of Public Safety Minister Ralph Goodale acknowledged the RCMP had intercepted and arrested 4,500 irregular border crossers in Quebec so far this month — on top of 3,000 that crossed in July. They are mostly Haitian and found eligible to file a refugee claim. On Monday evening, Cornwall city councillors held a special meeting to demand answers of federal, provincial and municipal officials, saying citizens are worried about the impact of all the new arrivals, while many others want to help. At the Nav Centre conference and hotel facility now hosting 300 people — all Haitian families — is full, and manager Kim Coe-Turner said that with upcoming conferences it cannot accommodate more immediately. 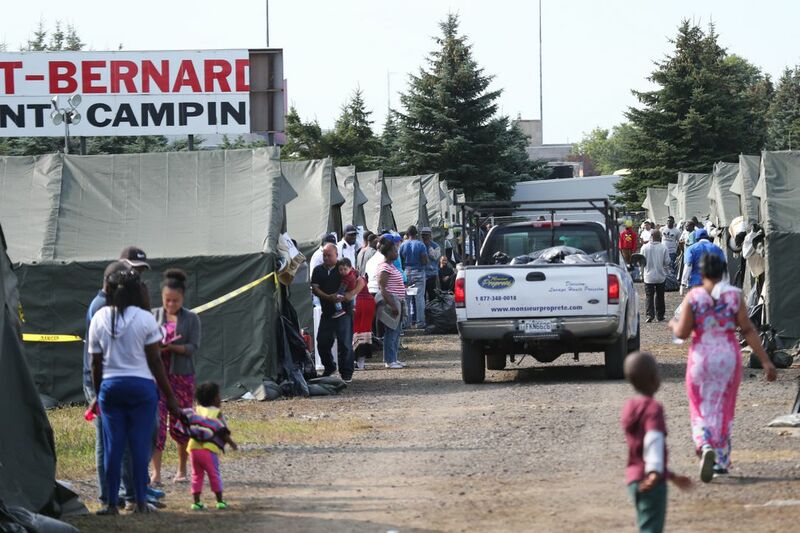 So the Canadian Forces are setting up a tent city on the Nav Centre grounds that will be an “interim lodging site” for up to 500 Haitians asylum seekers who will be directed there by border services authorities at Lacolle, Que., because Montreal’s shelters and services are overwhelmed, said Cornwall’s emergency management coordinator Bradley Nutley. Nuttley assured councillors that the families can be well accommodated in tents with plywood flooring, electricity and heating, while nearby residents’ concerns will be met by low-noise electrical generators, and privacy fences up to 12 feet high to be erected on three sides. In part, he said, that’s to protect children — over 40 per cent of the refugee claimants now there are children under 7 — from “noxious weeds” on nearby land. “Whoever the lead is, hopefully, they’ll get the bills,” said Councillor André Rivette said. He asked if Ottawa planned to set up a field hospital so that local residents wouldn’t find themselves waiting for health services. Stressing that no declaration of emergency had been issued because there are enough resources to meet the needs, Nuttley said almost all newcomers were quite healthy. There’s even been one birth of a “new Canadian citizen,” and a few more pregnant women are at the centre, he said, though officials see no need for anything more than a temporary clinic on the Nav Centre grounds. “I’ve not been requested to provide any services in this emergency – ‘er this event, sorry, a little Freudian slip there,” said Nutley. Still, Louis Dumas, a senior federal immigration official, acknowledged “the current situation is a difficult one, we are seeing a spike” at Lacolle, Que. Refugee claimants are “entitled to due process” and the federal government’s goal “is to process people quickly,” he said. The hope is refugee claimants will within a week complete their applications and submit them for an assessment at a joint federal-provincial processing centre also set up at Cornwall’s Nav Centre before their claims are sent to the Immigration and Refugee Board for adjudication. But once their claims are submitted, the migrants are free to leave and most are expected to head back to Montreal where a large Haitian diaspora lives. Dumas said about 10 per cent will likely head elsewhere in Canada, mostly in Ontario. Haitians are flooding across the border because the United States administration under President Donald Trump has indicated it will revoke a temporary protected status for Haitians, issued after the 2010 earthquake, starting in January. Dumas said Haitians should not expect Canada will automatically allow permanent entry. He noted that last year, the independent IRB turned down 50 per cent of asylum claims by Haitians, who were then ordered deported back to Haiti. That line is to be echoed by Haitian-Canadian MP Emmanuel Dubourg who Canadian Press reports is being dispatched to Florida to do Creole-language interviews and meet community leaders among Miami’s Haitian diaspora and to speak to a slew of influential media outlets.